Most of us have considered moving out iTunes library to an external hard drive to save space at one time or another. If you use a MacBook Air, you know how squeezzed for space you can feel after using a laptop with a much bigger hard drive. Heck, we’ve even written about saving space via iTunes migration. But what about iPhoto? True, pictures take up less space than iTunes videos, or even MP3 tracks, but more and more these days we’re taking photos with huge pixel counts with similarly large file sizes. And what about all the movies we use our iPhones or cameras for? They eat up a lot of space, too. So, you might at some point want to move all the photos and home movies you manage in iPhoto to an external drive to save space. Here’s how. The first thing to do is to move the iPhoto Library itself. Be sure you have the external hard drive you want to put your iPhoto Library and files on is connected. Then, open your home folder, then the Pictures folder within. Find the iPhoto Library package, and click once on it to select it. Move the selected package file with Cut from the Edit menu, or drag and drop it to an external hard drive. If you choose to cut/paste the file, paste it onto the external hard drive. This could take some time, depending on how many photos and/or videos you have in there. Next up, you just have to tell iPhoto where the Library is. Hold the Option key down and launch iPhoto, either with a double click on the Application in the Applications folder or a click on the icon in the Dock, if you keep iPhoto there. iPhoto will display a list of currently installed iPhoto Libraries. If you see the one you moved in the list, click on it. If not, click on Other Library and navigate to the spot on your external hard drive that you put the iPhoto Library from the steps above. Hit the Choose button to complete the process. 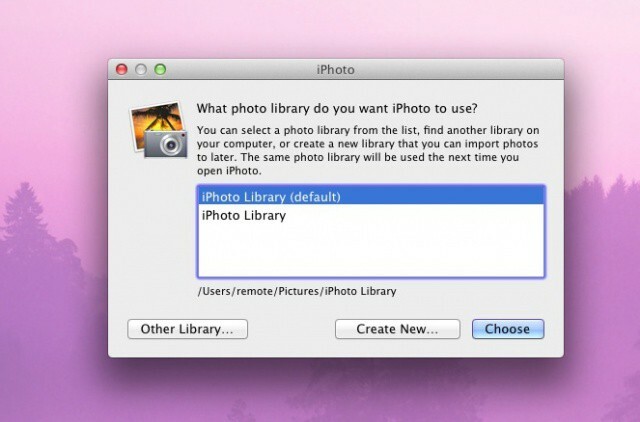 It might take a couple of seconds for iPhoto to figure this out, but once it’s all done, you’ll be able to open iPhoto as per usual in the future, without having to choose the library again. To put it back on your Mac, simply do the same steps above, and then point iPhoto to the new location on your Hard Drive.